He shoots, he scores, they win! You know how March Madness goes. It's filled with absolute insanity and upsets and is a heck of a good time to watch. 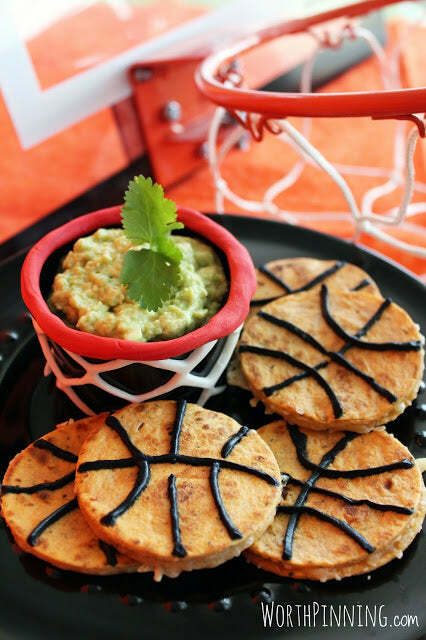 If you want some equally as incredible, jaw-dropping, and record setting treats and party ideas to accompany the games, take a look at how to throw the best basketball viewing party with our basketball-themed recipes and March Madness snacks. Look the part this tournament by making jersey cookies of your favorite basketball team! 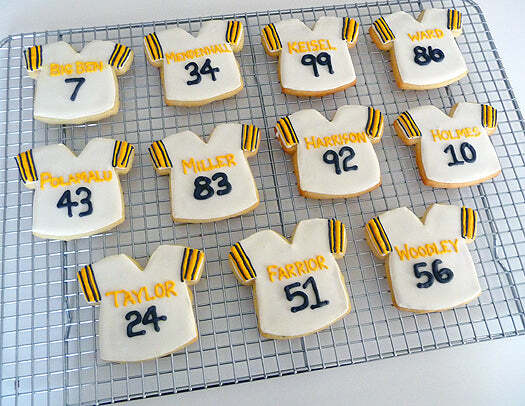 These are for the Steelers, but pick your favorite college basketball team and model these cookies off of their jerseys. Use the names of your top players or the whole roster to show your support. These will probably go quick because they're so tasty, so make sure to snap a shot to show off to friends before everyone digs in! Popcorn is so versatile. Keep it salty and buttery for the movies. Give it a spicy sprinkling of chili powder for a hot kick. 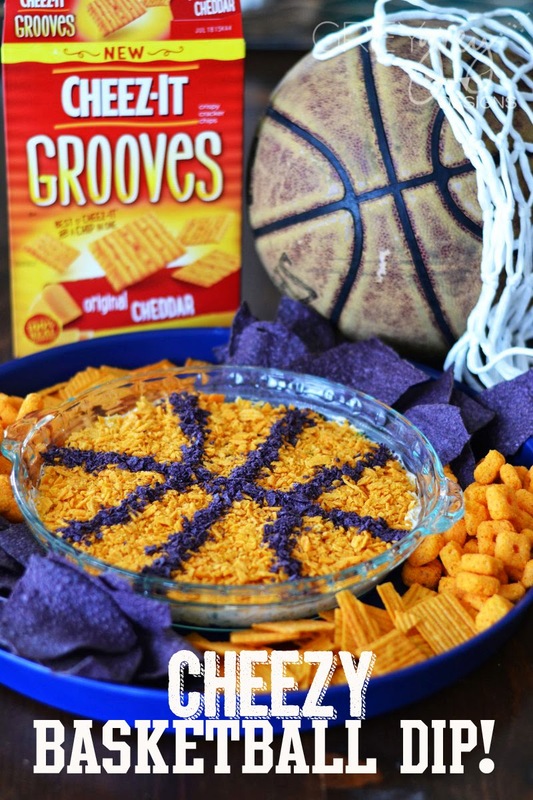 Even try this salty and sweet basketball-inspired recipe for a whole new twist on a classic snack. This recipe can be made anytime. The main thing you need to do is make sure you use basketball inspired containers to keep with the theme of March Madness snacks. Copy the baker below and use popcorn bags that you mark up to look like basketballs or even use black and white striped bags that look like referees. 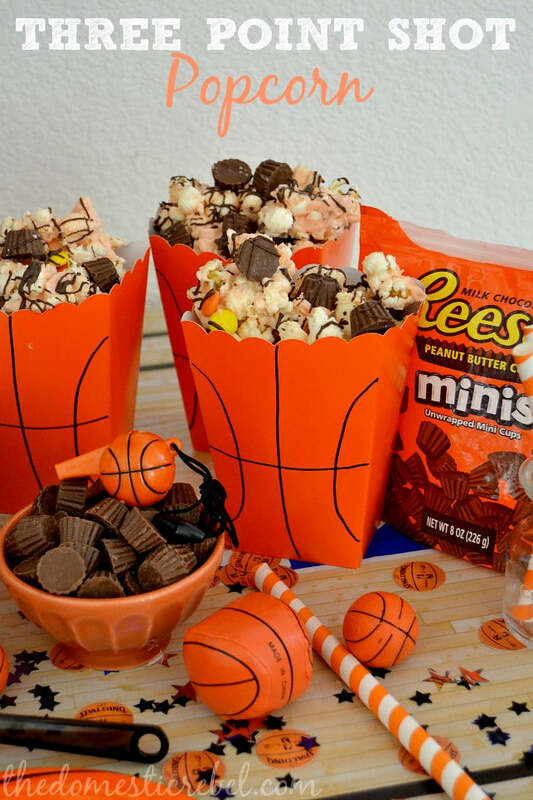 Either way you go, no one will boo you for this tasty mini Reeses cups and popcorn snack and fun presentation. Need a main dish to keep yourself going through the long days of the first rounds of the tournament? These slam dunk quesadillas are there for you through each half. Again, these quesadillas really aren't very different taste-wise than other recipes you've probably had. The key here is to cut them into circles and either pipe on refried beans in the shape of a basketball's stitching or use black dyed sour cream. They're really flexible, so cook with whatever toppings you love most, get your round cookie cutter out, and get ready to dunk these over and over into guac and sour cream while you watch and cheer. 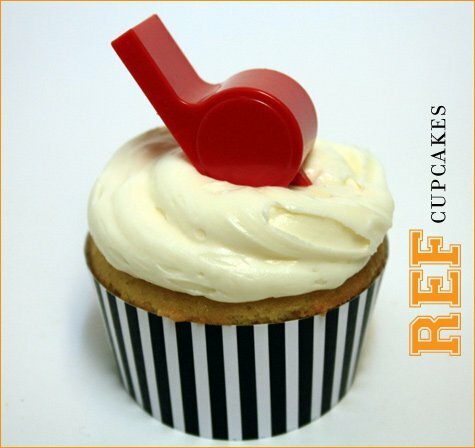 This cupcake was made for the Super Bowl, but there are refs for basketball too! Whip up your favorite cupcake recipe, get black and white striped cupcake liners, plastic whistles, and frosting. Then, decorate them like this. If you get real whistles, then all of your guests can blow them when they're watching the game and making their own calls. 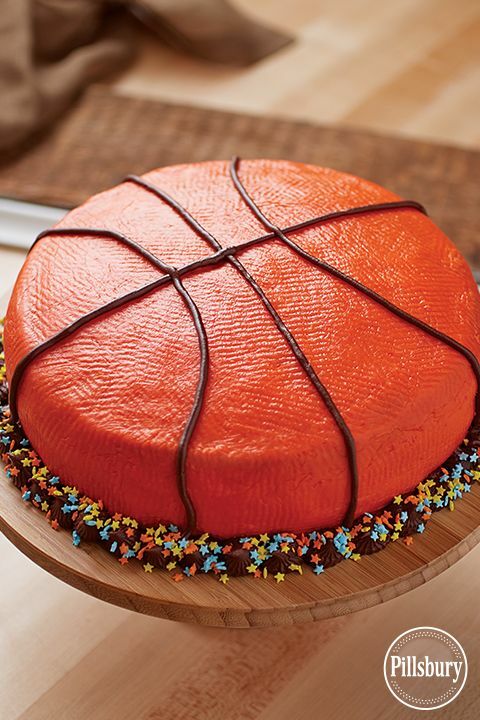 And since the tournament is known to be insane, these March Madness snacks get pretty noisy. You've got your starting line-up right here. Set some of these sliders on a platter and let your fellow fans chow down during half time to refuel. 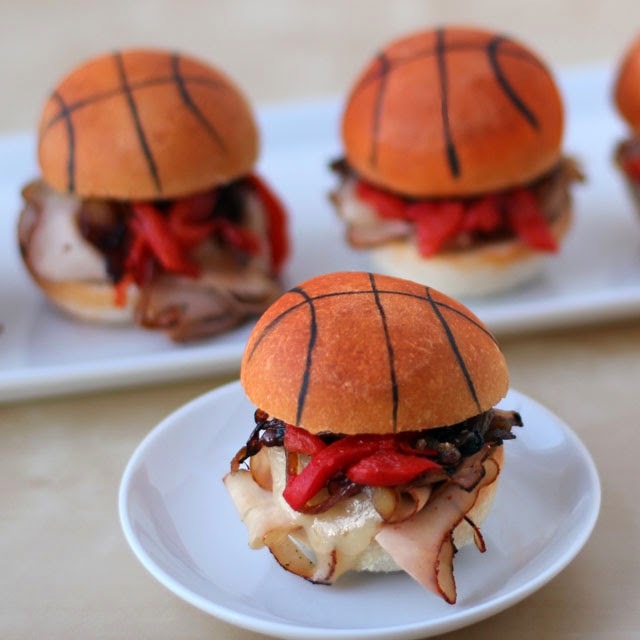 We love this recipe because it's essentially just a regular slider-it's just decorated to look like a basketball! You can use food-safe markers to get this look or if you're really crafty, get some char marks from the grill in a basketball stitching pattern and you'll be golden. These aren't a recipe, per se, but if you fill them with orange soda or orange colored candy they kind of are! Either way, we couldn't pass up these awesome basketball hoop inspired cups. 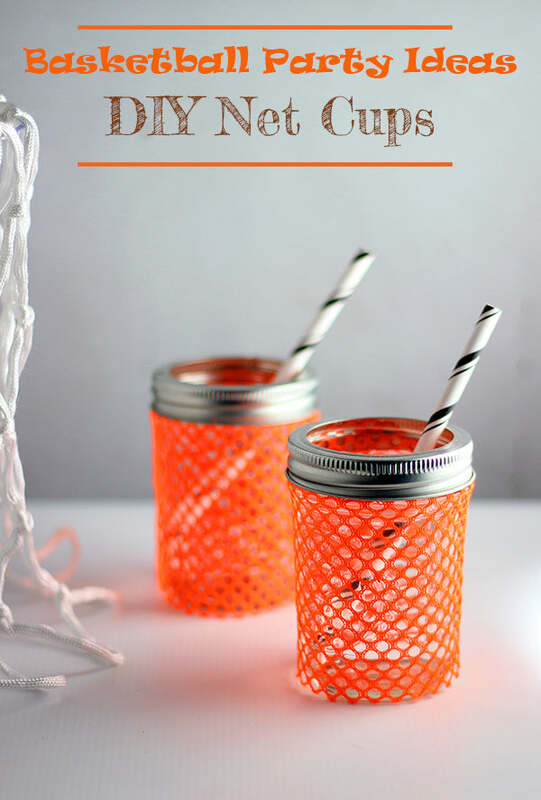 Order some orange netting and mason jars. Then, cut the netting to size and secure it under the rim of the mason jar. You can take off the inner metal top so that your guests can stick straws in and enjoy the bright orange drinks from basketball themed cups. Who doesn't love Rice Krispy Treats? Exactly. These are awesome because you can use your favorite recipe and then just roll them into balls instead of pressing them flat into a pan. 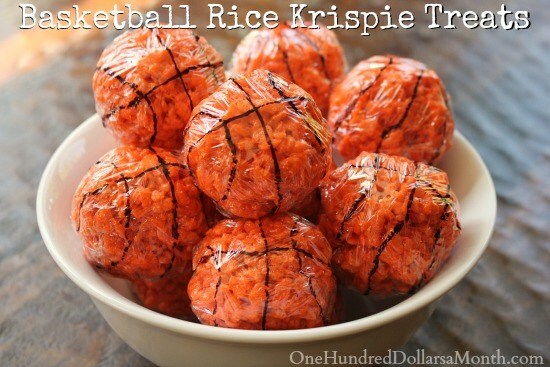 Make sure you buy orange plastic wrap and get a permanent marker ready to draw the lines of a basketball on the outside once they're wrapped. Put these in a bowl on the coffee table for basketball viewers to snack on during tense moments or while there's downtime. There can only be one champion. Let this cake be the star of your party. Mix up two 9" round cakes (from a mix or from scratch), then prepare some orange frosting and get your black icing ready. The key to making this cake look exceptionally life-like is by texturizing the frosting. All you need to do is pat the top of the frosted cake with a paper towel after you've frosted it and let it air dry for 20-30 minutes. Once that's done, add the lines, blow the whistle, and let your own team have at it. College basketball is so fun because every team has its very own cheerleaders and marching band. 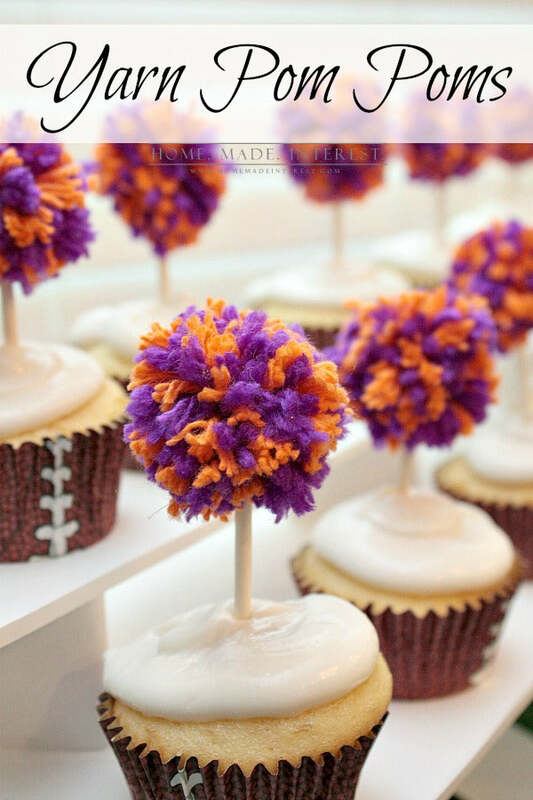 Show your support for your favorite college hoops team by making these pom pom cupcakes. 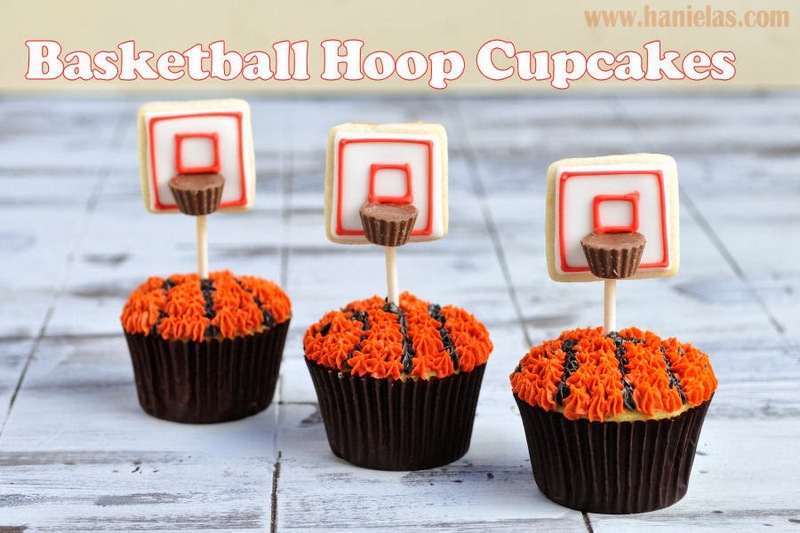 If you're already planning on whipping up some of the basketball hoop cupcakes above, then set half aside to decorate this way. Then, you'll have a great variety of March Madness snacks to look at and to eat! Did we mention that March Madness games go on for hours when it's the beginning of the tournament? You'll need a lot of grub to get you through every shot clock, half time, free throw, and overtime-like this yummy cheese dip. This is another dip that's very simple to make and requires little skill to give it a basketball look. Follow the recipe this baker used or use one you know you love and then decorate it with black lines to look like a basketball. This recipe isn't customized for basketball, but you could use your favorite sugar cookie recipe to make some shot clock cookies! Just use seconds instead of minutes and make a cool shot clock cookie with red cinnamon imperials. The colors of your favorite team jerseys could also decorate these winning treats. 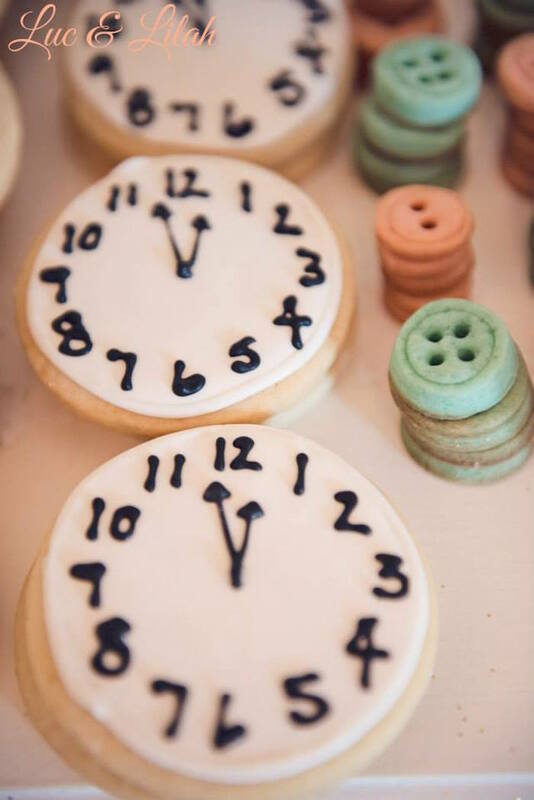 It's always super suspenseful watching the time tick down-and it'll be just as nerve racking for these cookies as they wait to be devoured by your party guests!